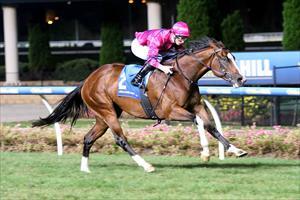 Flemington trainer Danny O’Brien could take smart mare Miss Rose de Lago to Sydney for a Group I assignment after her dominant win in Thursday’s night’s Group II Sunline Stakes (1600m) at Moonee Valley. Miss Rose de Lago led throughout the $200,000 contest before scoring by 2-¾ lengths but O’Brien has a Randwick assignment in mind for the former Perth mare. "We could potentially take her to Sydney and run her in the mile mares’ Group I (the Queen of the Turf Stakes) there in a fortnight,” O’Brien said. "She’s a high-class mare. She’s been terrific since she came over from Perth to us and she’s really gone to another level tonight. James McDonald guided Miss Rose de Lago to her comfortable success. The Sydney-based rider said the five-year-old travelled perfectly to the 600m before quickening strongly. "She has a high cruising speed and she rolled along really well. She got down the side and when she increased, I thought to myself, ‘it’s going to have to be a good mare to get past her’,” McDonald said. Punters backed Noble Protector from $7.50 to $5.50 late in betting before she made ground in the straight to grab second ahead of Metaphorical ($12). The $2.60 favourite Fenway races handy to the speed for jockey Blake Shinn before she was outsprinted in the last 400m, finishing fourth. Miss Rose de Lago’s win completed a Moonee Valley double for O’Brien after Zahspeed scored an easy win in the $80,000 Tour of Victoria Middle Distance Final (2040m). Glen Boss was aboard Zahspeed ($5) in his four-length win over Tenacitus ($4 fav) and Word Of Mouth ($6).